Are Paddleboard Lanes Coming to Newport? 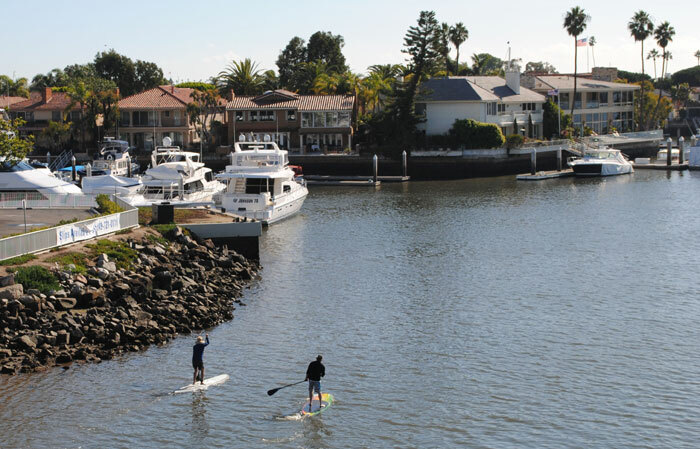 NEWPORT BEACH — With the many sailboats, charter vessels, sportfishing boats, kayaks, daycruisers and other craft plying Newport Harbor, the recent addition of many stand-up paddleboarders in the harbor has some locals wondering if everything is safe on local waterways. Stand-up paddleboarding — sometimes called SUP — has exploded in popularity in recent years, with multiple rental companies popping up in the harbor. As a result, hundreds of paddleboarders navigate the harbor on 12-foot boards each year, sharing the waterway with all of the other traffic. Some locals have said that with the influx of everything from novice paddlers to yoga instructional classes on paddleboards, the harbor is becoming an unsafe place for vessels to navigate. City Councilwoman Leslie Daigle noticed the added congestion in the harbor, and has asked the Newport Beach Harbor Commission to look into safety issues related to local paddleboarding. She cited a lane separation system that has been put in place in Honolulu to lessen interactions between boaters and paddleboarders as an example of a tactic that may be effective in Newport Beach. In Honolulu, a designated paddleboard lane was created using buoys to separate the paddleboarders from swimmers at the popular Ala Moana Beach Park. Newport Beach Mayor Nancy Gardner, who is a paddleboarder, said she would not support a lane separation plan. The city council will decide at a future meeting whether paddleboard lane separation schemes should be investigated further by the Harbor Commission.